MSNBC/TwitterSurveillance footage of Mark Anthony Conditt, the Texas bombing suspect. Citing law-enforcement officials, multiple news outlets have identified Mark Anthony Conditt, 23, as the suspect in recent bombings in Austin, Texas. Conditt blew himself up early Wednesday after being pursued by police. Officials believe the suspect was responsible for all the bombings in and around Austin this month. Authorities have not yet publicly identified a motive for the spate of bombings. 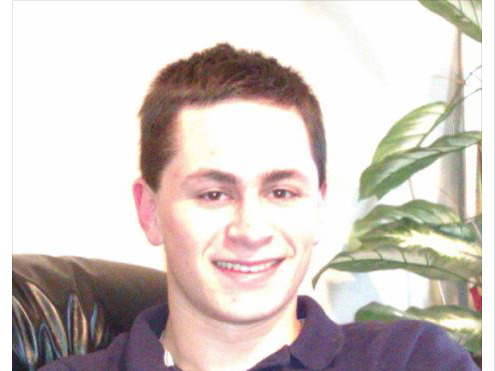 Law-enforcement officials identified Mark Anthony Conditt on Wednesday as the suspect in the wave of bombings this month in and around Austin, Texas, according to multiple news outlets. Conditt, 23, died early Wednesday when he blew himself up in his vehicle as authorities closed in around him. Citing officials, NBC News and The Wall Street Journal later identified Conditt as the suspect. The Austin Police Department told Business Insider it would not confirm an identity until more ID checks had been completed and family had been informed. Authorities filed a criminal complaint in federal court on Tuesday night, charging Conditt with one count of unlawful possession and transfer of a destructive device, federal officials announcedWednesday. 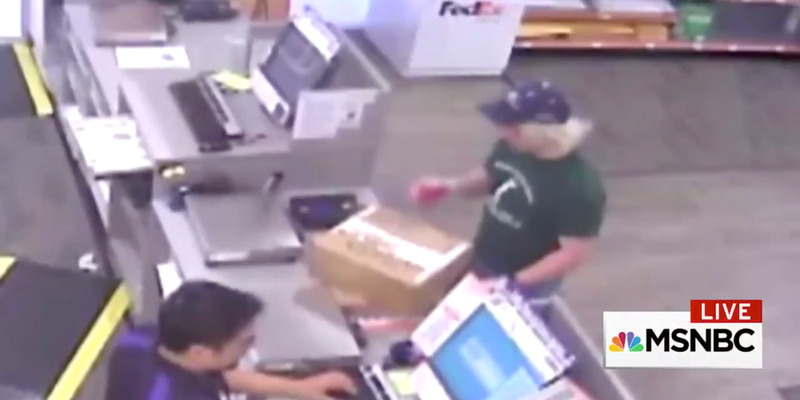 NBC News also posted a video showing who it said was Conditt mailing packages at a FedEx store. Conditt lived in Pflugerville, a city north of Austin, the Austin American-Statesman reported. He was home-schooled before attending Austin Community College and working as a computer-repair technician, the report said. The Associated Press described a Texas congressman as saying the suspect bought bomb-making equipment at a Home Depot in his town. Conditt appeared to have a Facebook account but an otherwise sparse social-media presence. Police believe Conditt is responsible for the recent spate of bombings in and around Austin that have killed two people and injured several others since March 2. Officials have not publicly identified a motive. 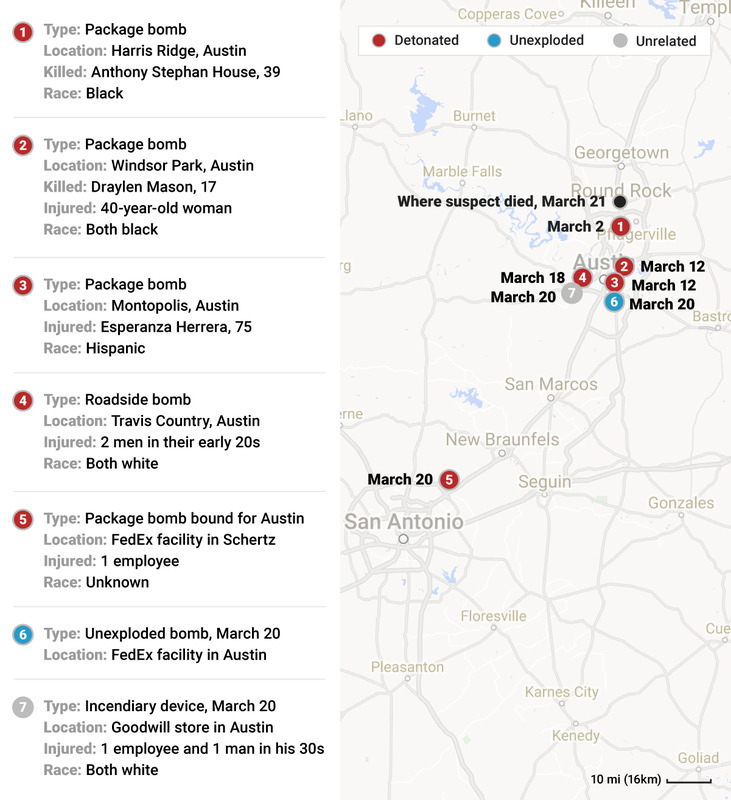 Last week, the Austin police chief, Brian Manley, told reporters that officials were investigating whether the bombings were race-related. 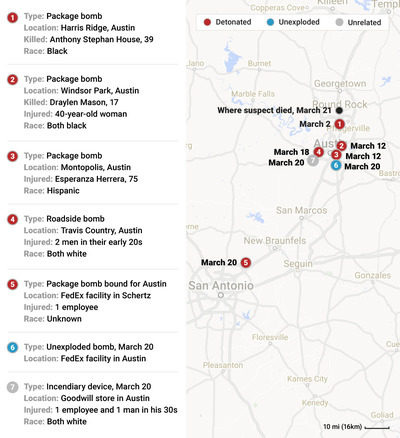 The first package bombing, on March 2, killed a black man, and two other parcel bombings on March 12 left a black teenager dead and injured a black woman and a Hispanic woman. Two white men were injured in an explosion on Sunday; authorities believe that device was set off by a trip wire. Law enforcement identified Conditt as a suspect after seeing surveillance footage from a FedEx store south of Austin, the American-Statesman reported. Officials then tracked down his online browsing history, which they said showed searches on various shipping facilities, and eventually located his vehicle, the BBC reported. US President Donald Trump congratulated “law enforcement and all concerned” after Conditt’s death. AUSTIN BOMBING SUSPECT IS DEAD. Great job by law enforcement and all concerned! Police are still trying to figure out where the suspect was in the 24 hours before his death and whether there are other devices programmed to explode.